If you are selling your home in Spain and the sales price is higher than the amount you paid for it initially then you will be liable to pay Spanish property taxes over the profits. There is some confusion surrounding this tax, in particular, the rates that apply, so here we look at all the options in detail. How much is the profit on my property in Spain? If you sell your property and you make a profit (positive difference between original purchase price and final sales price) then you need to pay property tax (impuesto sobre incremento de patrimonio de la venta de un bien inmeuble). To calculate the right amount of profit, one takes the price of the original purchase of the property plus the costs involved in the sales of the property but also the costs of repairs and refurbishments to the home. The price will also be adjusted with regards to inflation. After adding all this up, you will get to the “final purchase price” and this amount is deducted from your sales price. The “profit” that is left will be used to calculate how much your Spanish Property Taxes will be. If you use the takings of the sale of your home in Spain to re-invest in another Spanish property. You will have to have been resident for 3 consecutive years and have lived in your sold property. You will also need to show that the newly purchased property is now your main residence. If you are older than 65 years of age, have been resident for a minimum of 3 consecutive years and lived in your sold property during those years. The amount of property tax you have to pay depends on your current status as a resident or non-resident in Spain. As residents pay a different rate for property tax than non-residents. The property tax for residents is levied through your income tax in the year the property is sold. For non residents, the property tax is a fixed rate of 21% regardless of the price of the property. The notary will furthermore withhold 3% of the sales price to cover any outstanding taxes you might have. If you don’t have any outstanding taxes to pay, you can apply for a refund with the tax office in the following tax year. 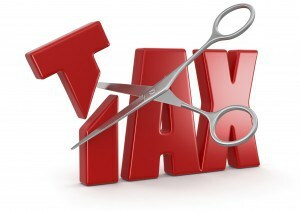 Less taxes for a lower sales price? The profit on your property will be lower if you lower your sales price, so many home sellers think they beat the system by changing the sales price in the escritura to a lower amount. This is not unheard of, and does happen but can only happen if your buyer agrees with this too and thus pays you a part of the sales price “under the table” and this way the seller can show less profit on their property. The tax office, however, is keeping an eye on this practice as they have a register of what homes are worth and if they see the sales price does not match the value of a property the alarm bells will go off and the buyer could be in for a hefty fine. The seller will argue to a buyer that it could look attractive to add a lower price in the escritura, because the transfer tax will be lower but as a buyer you need to keep in mind that when it comes to selling the property in the future, you might not be as lucky in finding someone willing to “cook the books” and you are left with paying a higher income tax than you should have because your “escritura” shows a lower purchase price than what you really bought it for. 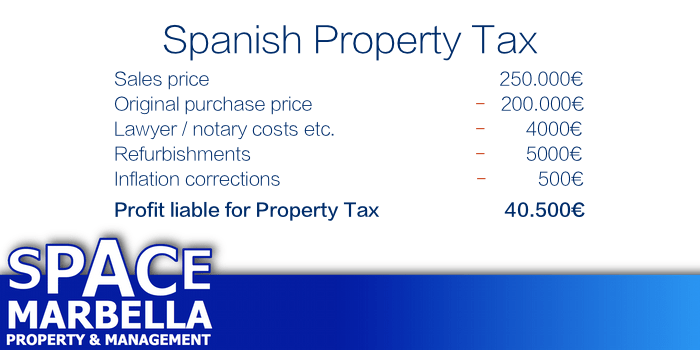 Another tax you need to keep in mind when selling a Spanish home is the Plusvalia (Capital Gains Tax). This is a levied tax from the local council and is based on the value of the plot on which your property is built. The amount of Plusvalia depends on the cadastral value and the amount of time you have been the owner of the sold property. The longer you have owned the property, the higher the Plusvalia. Plusvalia officially needs to be paid 30 days after the notary has registered the sale of your property, but in most cases is deducted at the moment the sale is completed so the buyer does not get in trouble if the seller neglects to pay the Plusvalia, since the buyer is responsible for the Plusvalia after the sale has been completed. In some cases, buyers and sellers will negotiate who pays the Plusvalia, but in most cases, it is the seller who will foot this bill. There are other taxes to be aware of though and it is always advised to speak to your estate agent on the exact cost of selling your property so you can decide wisely on the sales price. The biggest one, by far though are the Spanish Property Taxes and once you have established what those are for your property along with other costs involved it is time to put your home on the market and try to get the best return possible. Space Marbella has many years of experience in Spanish Property Taxes can help you get the best “deal” possible as there are some loopholes that are worth looking at, so please don’t hesitate to speak to us about the available options.